Earlier this year, a business writer for The New York Times invited students to share their college admissions essays on the topic of money, class, working and the economy. Today, reporter Ron Lieber published his follow-up article, where he shared his reaction and thoughts on the effectiveness of those essays. He also had Harry Bauld, who wrote the classic guide on how to write these essays (On Writing the College Application Essay), read them and give his opinions as well. I hope you take the time to read this article all the way through. Lieber said he and Bauld “meant to inspire” students shooting for college in 2014 by sharing their four favorite essays. Click HERE to read all four essays. I’ve copied one of the essays below because it was my favorite, mainly because of the narrative style of writing (he tells a story) and his lovely mix of pride and humility. The writer, Lyle Li, also focused on the mundane (everyday) quality of his life–especially his mom’s job–which is a technique that I encourage students to try in their essays. It brings an instant modesty that can’t help make the writer appear genuine and likable. Slightly annoyed, I put on my sandals and proceeded downstairs. Mixing the hot water with cleaning detergents, I was ready to clean up the restaurant floor. Usually the process was painstakingly slow: I had to first empty a bucket full of dirty water, only to fill it up again with boiling water. But that night I made quick work and finished in five minutes. My mom, unsatisfied, snatched the mop from me and began to demonstrate the “proper way” to clean the floor. She demanded a redo. I complied, but she showed no signs of approval. As much as I wanted to erupt that night, I had good reasons to stay calm. Growing up in rural China, my mom concerned herself not with what she would wear to school every day, but rather how she could provide for her family. While many of her classmates immediately joined the work force upon completing high school, my mom had other aspirations. She wanted to be a doctor. But when her college rejections arrived, my mother, despite being one of the strongest individuals I know, broke down. My grandparents urged her to pursue another year of education. She refused. Instead, she took up a modestly paying job as a teacher in order to lessen the financial burden on the family. Today, more than twenty years have passed, yet the walls of my parents’ bedroom still do not bear a framed college degree with the name “Tang Xiao Geng” on it. In contrast, when I visit my friends, I see the names of elite institutions adorning the living room walls. I am conscious that these framed diplomas are testaments to the hard work and accomplishments of my friends’ parents and siblings. Nevertheless, the sight of them was an irritating reminder of the disparity between our households. I was not the upper middle class kid on Park Avenue. Truth be told, I am just some kid from Brooklyn. Instead of diplomas and accolades, my parents’ room emits a smell from the restaurant uniforms they wear seven days a week, all year round. It’s funny how I never see my mom in makeup, expensive jeans, lavish dresses, or even just casual, everyday clothing that I often see other moms wearing. Yet, one must possess something extraordinary to be able to stand in front of a cash register for 19 years and do so with pride and determination. On certain nights, I would come home sweaty, dressed in a gold button blazer and colored pants, unmistakable evidence of socializing. In contrast, my mom appears physically and emotionally worn-out from work. But, she still asks me about my day. Consumed by guilt, I find it hard to answer her. Moments such as those challenge my criteria of what constitutes true success. My mother, despite never going to college, still managed to make a difference in my life. Tomorrow, she will put on her uniform with just as much dignity as a businesswoman would her power suit. What is her secret? She wholeheartedly believes that her son’s future is worth the investment. The outcome of my education will be vindication of that belief. In hindsight, I’m astounded at the ease with which I can compose all my views of this amazing woman on a piece of paper, but lack the nerve to express my gratitude in conversations. Perhaps, actions will indeed speak louder than words. When I graduate on June 1st, I know she will buy a dress to honor the special occasion. When I toil through my college thesis, I know she will still be mopping the restaurant floor at 11:00 PM. When I finally hang up my diploma in my bedroom, I know she will be smiling. *And I have to mention my own collection of stand out college application essays: Heavenly Essays. 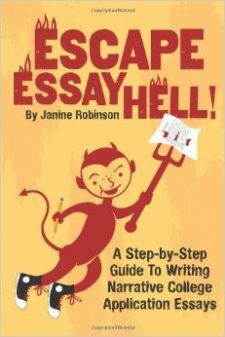 It includes 50 narrative-style essays all written by real students who got into terrific school. *More on the dangers of writing a dull essay HERE. *Don’t be discouraged by the impressiveness of these four essays. You can write one just as engaging and meaningful. If you need help getting started, try my Jumpstart Guide. Still Looking for That Magic Topic? Try a Sample! How to Answer the Most Common Supplement Question: Why College X? i’ve always wanted to be a teacher since my childhood. i used my living room’s wall as a board. as i grew up, i taught my peers. and in highschool volunteered in a community school. i have tried writing on several topics for college essay and none seem to work out. it seems this topic is pretty straightforward too. what do i do? i’m very perplexed.